With the Zoom F8n not far away with a release date of July, I’d thought I’d write up my hopes for the F8n which seem like reasonable wishes (or at least semi reasonable!). Many of these might also be doable as a firmware update for the existing F8/F4 models. The XLR inputs will be mic/line switchable, which is a nice small addition. So then I won’t need to use 1/4″ cables from my Lectrosonics transmitters for putting line level into the recorder. Improved limiters that “look ahead” (via the magic of time travel! Or rather the magic will be done via having a cache). Price will be US#1200 (but not set in stone), which is steeper than the US$1K launch price of the original F8, but not by much at all (although, the F8 now has fallen in price to under uS$800! Which is amazingly cheap). And the F8n is still a lot cheaper than the Sound Devices MixPre10T (and the F8n isn’t even that much more than say the MixPre-6, yet I’d much rather have the Zoom F4 as my only main recorder than the MixPre-6. So even at US$1.2K the F8n will be absolutely phenomenal value!). Plus also a number of secret unannounced improvements, which we’ll find out about in July. And it is about these which I’m writing about that I hope we’ll see. Although we can’t set our hopes up too high! 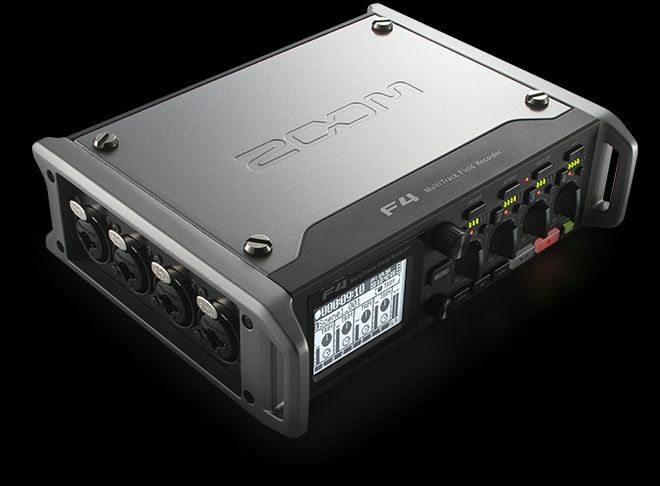 As the Zoom F8 original has only been on the market for two and a half years, which is a somewhat short period of time in the professional sound market. Thus we can see the Zoom F8n as more like a mid life cycle product refresh. Currently the F8/F4 has “consumer line level output” (or mic level), which basically makes their so called “line level output” pointless for me to pair with any of my wireless transmitters or to send directly wired to camera. The F8n needs proper pro line level output rather than their current anemic “line level”. Metadata History: I love that when I’m entering in metadata into my F4 I can quickly grab past metadata entries via scrolling through the history, rather than dealing with the finicky on screen keyboard. However, the history page doesn’t go anywhere nearly far back enough! Plus for the sake of metadata consistency it is really nice if I can keep on reusing exactly the same spelling/description as I’ve used in the past on the shoot. PFL key: on the topic of metadata, why don’t I get more info about the track when I hit the PFL button? As sometimes I might forget what it is I’ve assigned to one particular track, and rather than hunting down into the metadata menus for everything, it would be much faster to be able to leap to that specific traffic to see. By in the PFL menu to see the name of the track from the metadata, and the option to edit the metadata for this track. Shortcut key: why why on earth do you need to press the STOP key on the F8 as part of accessing a shortcut function??? Seems like sheer madness to me! As if you need to access something quickly during a take (as often happens) I do not want my fingers to go anywhere near that STOP key! Ideally the Zoom F8n will have a dedicated shortcut key like my Zoom F4 has, or at the very least come up with a different arrangement than the high risk approach of using the STOP key as part of the shortcut key press combo. Yikes. While on the topic of the stop button, could it please be illuminated? Would save fumbling for it in the dark at the end of a take. Also if the stop button had a very small little bump on it (like a Braille dot) that would also help finding it without needing to look down directly for it. Safety track: this is a feature I really like of the Zoom F8/F4, and I nearly always use it for at least my boom mic. Especially with the way many productions “shoot the rehersal” or with actors/directors going off script, and you’re running sound solo so you’re booming as well then it is nice peace of mind to know you’ve got another layer of insurance at work. However, currently the safety track is set completely independently of the main track (heck, you could even set the gain of the safety to be higher than the main track if you wished!). But for the vast majority of shoots you don’t need that degree of customization, and I’d rather trade that freedom for instead the speed of just having the safety track be automatically a set amount lower than the main track (although this should be customizable, to say: 0, -6, -12, -24 dB or any other number you might wish to use it for. As depending on the expected dynamic range of the scene you can then select the appropriate sized gap between the main track and the safety track). Thus I’d hope in the safety track recording menu of the F8n (or even the F8/F4, with a firmware update) to have an option for the safety track to either be freely set to any level or to be set to a fixed amount lower. Automix, like the Sound Devices 633 and 688 have. Automute the outputs when not recording, very handy indeed if you want to give a degree of privacy to people who are wired up while a take is not rolling. A rather ambitious desire I’ve got for the F8n is showing audio waveforms of recorded tracks, even if it doesn’t show it for all the tracks at once but only the one selected track at a time. One example of where such a feature could come in very handy is if you want to check back on if a track is ok (maybe you want to check if a wireless hit or a clothing rustle is overlapping a line of dialogue), then you can very very quickly use the waveforms as a guide to skim ahead to exactly the right points on the track to listen to. This would massively speed up my process of quickly checking up on tracks afterwards. And I’m sure you can come up with more examples of how this could be a handy feature to have (such as quickly at a glance checking across the whole take for if any serious peaking happened, this is super handy if say you have had to drop your audio bag in a car boot during a driving scene and then you’ll be able to do a quick check on the take with a glance when the car gets back). Currently I believe such a feature with audio waveforms being displayed is only on the Aaton Cantar X3 and the Cantar Mini, two recorders at the opposite end of the price spectrum to the F8n! Currently the Timecome screen in the menu for the F8 (and F4) just displays the current internal TC and what is sees from the external source, but it would be very handy indeed if it could compare the two to show the difference between them like in this image from the Sound Devices MixPre10T’s screen. This would be useful for troubleshooting problems, catching out issues before they arise, testing out new gear, or simply for triple checking things for your own absolute confidence on set. While on the topic of timecode, a quirk that really bugs me as a flaw, is that pre-record completely fails to work if you’re using External Timecode at the same time. Which is rather annoying indeed, and caught me out a couple of times until I realised this slightly strange behavior was happening. 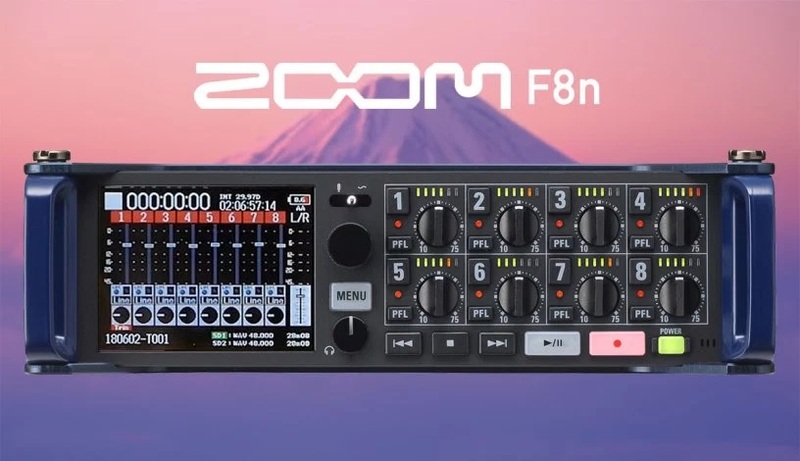 Anther hope is that the new Zoom F8n with the Zoom EXH-6 support 10 channel recording! (as the F8 with the EXH-6 doesn’t increase its channel count at all when the EXH-6 is used, rather it just replaces two of the existing XLR inputs that get removed as an option to use. Thus the channel count for the F8 doesn’t increase up from 8 at all when the EXH-6 is used) Being able to use an EXH-6 effectively with the new F8n for very high track count days would be handy indeed, and would demolish one more benefit the Sound Devices MixPre10T has over the F8 currently (10 channels vs 8 channel recording). Additionally I’d hope a EXH-6 v2.0 update would add locking XLR connections, rather than XLR connections that just sit there without locking in place. Again, this is another risk factor for something to go wrong if they don’t lock in place. Because currently as an F4 user I find the EXH-6 is very handy indeed, almost an essential piece of a gear for a F4 owner, but it is also darn bloody annoying at times!!! And these proposed changes to the EXH-6 would make my days significantly more stress free. I wish the Zoom F8n would be able to talk with my Timecode Systems :wave like the Sound Devices 6 series can. If the Zoom F8n could do this then that would be the single biggest feature I’d get excited about! (although naturally I’m a little biased, as I’ve got an existing investment in this timecode system). But it would be very exciting indeed to have this level of metadata integration, and being able to share it across all departments with the Movie Slate 8 app. Currently you can’t simultaneously use fully both the F8 iOS app and and the Zoom FRC-8 at the same time, would be nice if this could be resolved so that you could keep both connected at all times, then you can just grab and use whichever one is appropriate in the moment to use. One handy feature the Zoom F4 has, which the F8 doesn’t have (but I hope the F8n does), is that the Zoom FRC-8 F-Control can be powered via the USB connection (that I wish was a more sturdy full size USB connection on the F4, but it full size USB is on the Zoom FRC-8’s size!) from the Zoom F4. But the Zoom FRC-8 with the Zoom F8 needs to have its own powering for the FRC-8 to turn on. Which is a pity, as it would be nice to have one less thing to worry about batteries for, and it would make the FRC-8 when used with a bag rig (which some people do!!). But would be even nicer is if the USB input on the Zoom F8n can be used to directly plug in a keyboard (without needing to use the Zoom FRC-8 F-Control in between the recorder and the USB keyboard, like we have to do currently with the Zoom F8 & Zoom F4). As most people would find the Zoom FRC-8 too bulky to use with the bag rig, but they’d still like to use a mini keyboard with their kit for faster and easier metadata entry. Would be double nice if a wireless bluetooth keyboard could be used directly with the F8n, without even needing to use the USB input at all! How handy would that be? Especially if you are able to connect both the bluetooth keyboard and the Zoom app to the recorder at the same time running side by side simultaneously (on which point, why is there no Android app? And even the iOS app hasn’t been updated in ages! I could also write a long blog post about all the improvements I wish they’d done for the F8 iOS app…..). On one past shoot I had issues on a rooftop that was stacked full of radio/tv/cellphone antennas, which my F4 experienced but my Sound Devices 552 was trouble free (luckily! So I switched over to the 552). Additionally any time I use my RodeLink transmitter too near to my F4 then I run into issues (simple solution: I don’t use it! Or at least only have the receiver in my bag, not the transmitter). Thus I hope Zoom improves the RF shielding with the Zoom F8n. 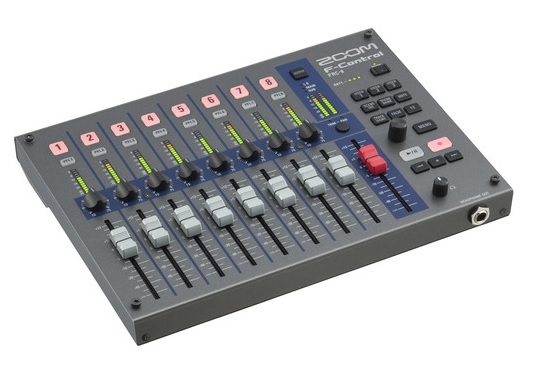 A very low priority for me personally, as I rarely use my F4 as a USB interface, but it would be nice if the F8n could be used as a USB interface and a recorder at the same time. As my F4 can’t record at all once it is set up as a USB interface (and I believe the current F8 has the same issue as well). Another small but handy change I’d like to see is if the clip peak indicators could automatically clear themselves (for those times when I’m booming and recording, and don’t have a spare hand or time to clear them myself after slating even via a shortcut) after a selectable length of time after you start rolling (for instance 15 seconds later, or even 2 minutes later, which you could pick depending on the type of production you’re on. Some shoots are very quick and timely between “turn over” and “mark it”, but others….. are not). The reason why I’d like to see this feature is because very often while I am booming I’ll look down at my recorder wondering if a track peaked, but I can’t tell! Because the peak indicator is still there (unless I manually cleared it) from when the take was slated at the start of the take. AES inputs would be nice on the Zoom F8n, but I suspect very unlikely with Zoom’s target demographic. Zoom already supports B format decoding for the Sennheiser AMBEO ambisonic microphone in their F8 & F4 recorders, thus I hold out reasonable hope that when the Rode NT-SF1 ships then Zoom will bring out a firmware update for the Rode NT-SF1 ? News got leaked accidentally by B&H that a new Zoom F4 is coming. I thought the Zoom F8 when it was announced was a groundbreaking new recorder in what it brought to a new low price point for soundies. Now the F4 is even cheaper (US$650 vs US$1K), and has nearly everything the F8 has! Except for most notably the lack of extra XLR inputs (8 vs 4, thus the names: F8 vs F4. The “F” = field recorder, “H” = handheld recorder such as H1/H4n/H5/H6) and the lack of an app for the F4 to mix on a tablet like you can with the F8. Oh, and in a more minor point the F4 has a monochrome screen vs the 4 color screen of the F8. But everything else (such as pre amps, and time code) is basically exactly the same as the F8! Some things are even an improvement, such as adding camera return to the F4 that was missing from the F8, adding extra short cut keys to the top of the F4, and using XLR outputs instead of the TA3 outputs the F8 has. The F4 is positioned quite interestingly, as it has nearly everything from the F8 (except for the extra XLR inputs and the tablet app), yet the F8 is a small enough bump up in price it will tempt a fair few people to spend a little more for those couple of extra features… however for many other people the F4 will suit them perfectly, as they won’t need more than the usual 4 (or occasional 6) XLR inputs and they won’t be using a tablet for mixing (but I would like to use a tablet for entering metadata! Hmmm…). Andrew Jones (who was one of the testers of the F4 for Zoom) said it is almost the same size as the F8, but (strangely!) is a tiny bit heavier. I guess cutting out a few XLR inputs does not save much weight, but where does the extra weight come from? Maybe it is more robustly built? Crazy idea time: what next for Zoom after the Zoom F4? Is a “Zoom F2” next? The idea might sound hilarious! But being serious now, if it is bag friendly (a very small bag!! ), ultra lightweight, and very cheap (perhaps US$400ish? Keeping the 50% price jump ratio from F2 to F4 to F8), then a Zoom F2 certainly would be popular! Heck, for the last couple of days I’ve been doing a job with my Sound Devices 552 which only needed the one XLR for the boom to be recorded, plus one XLR output to be sent to the Sony F3 as a reference scratch track. A “Zoom F2” would even be overkill for that! Could you pretty please make this “F2” dream come true Zoom? 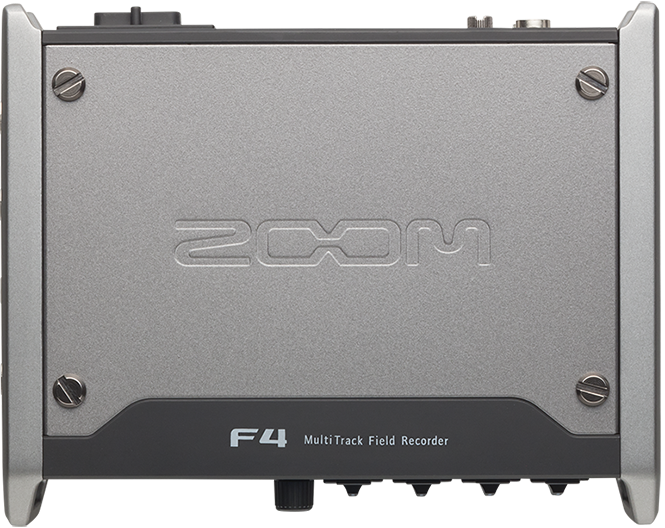 Designed to provide big Hollywood sound on an affordable indie budget, Zoom F4 is a 6-input / 8-track professional field recorder featuring super-low-noise preamps and timecode with pinpoint accuracy. The unit provides recording and playback resolutions up to 24-bit/192 kHz with impressive audio specs including an extremely low noise floor (-127 dBu EIN) and high gain (up to +75 dB), with +4 dB line-level inputs. The on-board temperature-compensated crystal oscillator (TCXO) generates timecode at 0.2 ppm accuracy and supports all standard drop-frame and non-drop formats, as well as jam sync for external devices. The advanced on-board limiters provide overload protection for all inputs and outputs, which lets you capture audio in a wide range of environments. Limiting can be applied simultaneously at full resolution with 10 dB of headroom and features controls for setting threshold, attack, and release. The F4 offers four combo XLR-1/4″ inputs, a 1/8″ stereo input, and includes a Zoom mic-capsule input for recording six discrete tracks with an additional stereo mix, all at full 24-bit/192 kHz resolution. Additionally, inputs 5/6 can function as a camera return for audio monitoring only for confidence checks. The dual-SD card slot features simultaneous recording to both cards allowing you to make a backup or split recording with all eight tracks on one card and a stereo mix on the other. Each of the four XLR-1/4″ inputs offers a dedicated preamp with gain control, phantom power, a six-segment LED level meter, plus a Record Ready and PFL switch. 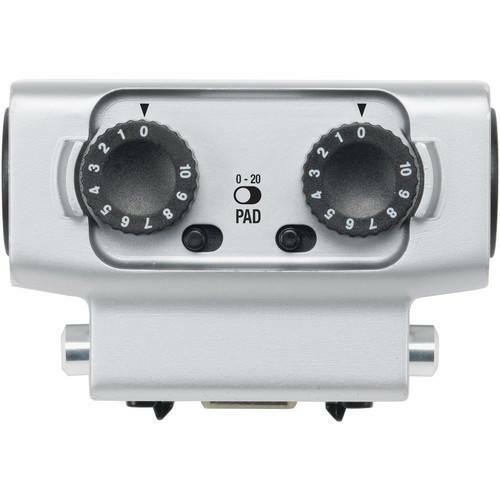 In addition to the 1/4″ headphone output with a dedicated volume control, the F4 provides two main balanced XLR outputs, as well as two sub outs on a single unbalanced 1/8″ stereo mini-jack, enabling easy connection to a camera. All timecode I/O is provided on BNC connectors and the unit includes a variable-frequency slate-tone generator to confirm levels. An easy-to-read 1.9″ LCD display is suitable for use in all lighting environments including dark low-light sets to bright sunlight. The on-board mixer not only provides user-adjustable level, pan, and input/output delay, but also offers high-pass filtering for noise and wind reduction, phase inversion, and Mid-Side decoding. The F4 ships with a camera-mount adapter, AC power adapter, and download codes for Cubase LE and Wavelab LE. Edit: ah ha! The Zoom page for the F4 is now up. Edit 2: now a few minutes ago Zoom tweeted the announcement. Edit 3: and now the B&H product page is live.